SICOMETAL S.A.S offers a full range of miter blades ranging from 1.30 m to 6.00 m for the holders of power from 40 to 500 hp. Blade RR with its special rubber base 30 mm, allows snow to slush or treated with salt. It helps to clear snow from city streets and mountain road up. The rubber base ensures a good scraping while avoiding collision with obstacles such as manhole covers, manholes or threshold gates. It is possible to mount a base polyurethane instead of rubber (optional). The blade body is made of polyethylene and ensures perfect gliding snow. The curve of the blade is specifically designed for snow and wind to avoid maximum projections of snow against the windshield of the vehicle. The blade is connected to the parallelogram by two ball joints allowing orientation, consisting of two telescopic cylinders SE, in order to reduce stress on the blade body and a large lift under the action of a double acting cylinder. The blade also has a vibration system to track changes in slope of the road. The blades are equipped with signaling LEDS, in accordance with standard NFP-98-795. SPR blade with steel or rubber base allows the clearing of snow, slush or treated with salt. The base steel or rubber has an effective system against obstacles with two independent retractable flaps coupled with double-acting shock absorbers gas. This system prevents the blade to jump after hitting an obstacle.The blade body is made of polyethylene and ensures perfect gliding snow. The curve of the blade is specially designed to prevent snow and wind maximum projections of snow against the windshield of the vehicle. 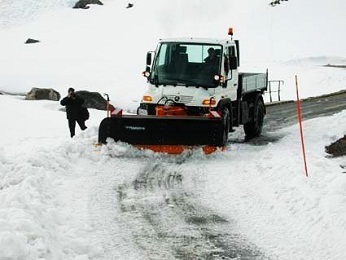 SPR allows the blade to clear snow effectively urban roads, roads plain, like the mountain roads. Blade retractable panels, allows clearing of all types of snow with a Robust security on mountain roads. Each panel has 4 elements vulkolan deformable having very good shape memory back to their original positions after passing an obstacle. The panels can overcome obstacles without damaging the structure of the blade and they fit the profile of the road. These blades are very quiet labor, no vibration is transmitted to the vehicle chassis. Hooves to wear steel or polyurethane (optional) 360 degrees, relieves wear steel blade 400 brinells. It is possible to mount a base rubber instead of steel. End of hooves can lean against sidewalks and curbs without damaging the body blades. The blade body is reinforced polyethylene and ensures perfect gliding snow thereon. The curvature of the blade is specially designed to prevent the snow and wind up projections of snow against the windshield of the vehicle. PV blade to 4 retractable panels, allows snow all types of snow with a foolproof security on rough roads mountain. Two blade heights are proposed for the PVR array. 1.05 m and 1.30m.